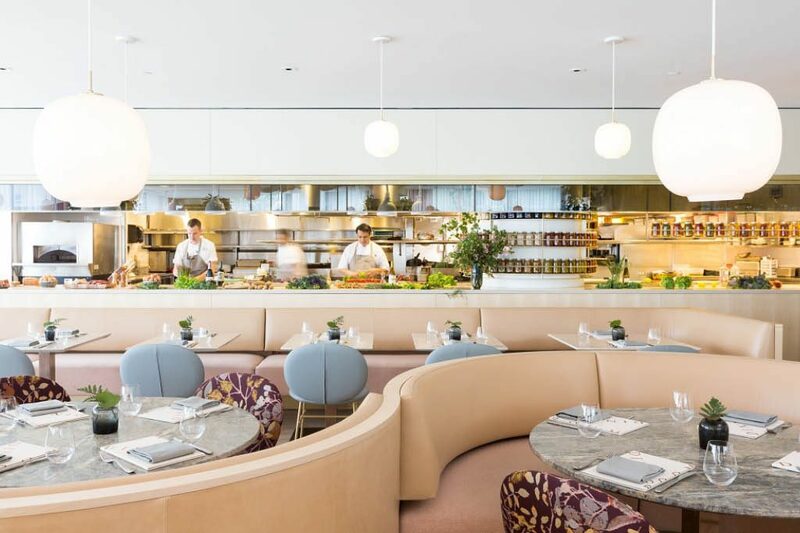 To create the second-floor Botanist restaurant at the Fairmont Pacific Rim in Vancouver, local firm Ste. Marie chose an approach that subverted the picturesque scenery of the Pacific Northwest. The team instead relied on subtle references to the mountain ranges that traverse the city in the cocktail bar and an “almost dreamlike” aesthetic in the rest of the restaurant, says principal and founder Craig Stanghetta. He also listened to the developer, Westbank, which values music and art in each of its properties. Consider the white Fazioli baby grand piano that now greets guests at the entrance to the dining room, as well as a stunning 180-foot-long origami light structure preserved from the original restaurant by artist Joseph Wu that spans the entire restaurant. “It was essentially the only thing we kept,” he says. To make the Botanist an alluring addition to the buzzy lobby, which is popular with locals, the firm created a glamorous French-inspired champagne lounge on the mezzanine with rose-colored furniture, a gold bar cart, and a marble, brass, and rose-toned bar that overlooks the lobby below—a tantalizing prospect for guests who are intrigued enough to venture further into the eatery. Along with the champagne lounge, the design team created three other distinct spots, including the moodier and terrazzo-clad cocktail bar; a garden room where lush foliage overwhelms the senses; and a triangular-shaped dining area with muted pastel tones, curved banquettes, and pops of floral upholstery for a delicate and warm design scheme. “We wanted to feel this sense of exploration,” he points out. The design firm wanted the space to be ethereal and romantic, so Stanghetta layered limestone, granite, and wood to juxtapose delicate sheers, glass, and lighting. “We like the idea of having this muted spectrum of materials and colors,” he adds, “which lend themselves to a nuanced differentiation.” The open kitchen is now a focal point with displays of preserved and pickled goods, while a bespoke wine room and an extended private dining area are new attractions. Completely rebuilt with marble-clad wainscot and fabric wall panels, the private dining room boasts a custom credenza with a built-in record player and even 31 framed illustrations from the 1824 edition of The Characters of Theophrastus by illustrator Francis Howell, which details the templates of the human personality through archetypal figures. Stanghetta and his team celebrated the strong counterpoints throughout the restaurant. For example, the soft tones in the dining room give way to the cocktail bar’s more opulent palette of black, navy blue, and brass. “The dining room is soft and fluid, but the cocktail bar was a rigidly structured monolithic piece,” he says, which snakes around the room and recalls the mountains nearby. “It’s a nice punch against the other elements,” he adds.